"I see Life as a journey, a mystery to unravel. The challenge is to reconnect with my essential Self, my true Nature freely and joy-fully as a contribution to Life. The process is a perfect circle. When I make art, I feel happy, truly alive and in touch with a sense of higher purpose. I desire that work be a mirror touching the uniqueness of each viewer and encouraging that Self to emerge." 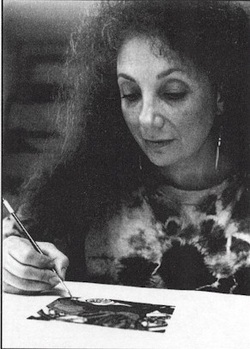 Jeanne Fingerhut was born in New York City, received her B.A. from Barnard College and her M.A. from the University of Paris - Sorbonne where she studied as a Fulbright Scholar. Although she painted and drew from early childhood, she did not pursue the study of art. Instead she became a teacher of foreign language specializing in phonetics an academic research. Life's events, however, led her into many artistic professions...textile design, illustration, hand-painted fashion...reminding her that painting and drawing were her greatest source of pleasure and expression. And so, while raising three sons and working in the fields of art, music and language, she painted consistently and showed her work in New York during the 1970's. In 1983 she relocated to the Pacific Northwest to devote full energies to art. Her work has expanded to include all varieties of mixed-media, cut-out collage paintings and, most recently, hand colored etchings which reveal her interest in strong composition, juxtaposed pattern and design craftsmanship. Her art is included in private, corporate and public collections in the United States and abroad. Jeanne past away in 2002 after a long battle with ovarian cancer.